DONT PAY $10 - $15 shipping - AAAHeadsets shipping is FREE. 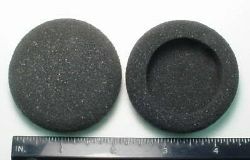 15729-05 - Replacement foam earcushions for older style Plantronics Supra (i.e Hxx) & Polaris (i.e. Pxx) series headsets. These are 5cm outside diameter. It is recommended that ear cushions be replaced every 6 months.